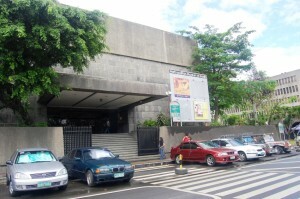 The Metropolitan Museum in Manila is the first Philippine art institution to offer a bilingual, didactic program. It believes in the use of art as a tool in the teaching of excellence, cultural values, and social responsibility, its not a government museum. The tactile exhibits of the museum are also very popular with the tourists as they have the opportunity to even touch and explore these artifacts. The Museum activities span a wide range, Philippine art exhibitions are curated from cultural institutions, private collections, and the Bangko Sentral ng Pilipinas Art Collection. Foreign art exhibitions are possible with the sponsorship of different cultural offices. In recognition of the value of scholarship, it maintains a strong relationship with the academic community, it has also acquired paintings, sculpture and prints, generous donations from Philippine artists, artists’ heirs, and private collectors. They form the nucleus of the first-ever Met permanent collection of Philippine contemporary art, and are exhibited on a changing basis, in thematic shows with varying responsive and education messages. Collections there were 93artworks – 70 odd paintings, and 2 -Dimensional works and 20 -23sculptures and 24 pieces in contemporary prints collection. It’s a nice huge place, and I was expecting the best of what I have experienced in other museums in different countries, it was only half full of what I seen upstairs there was a lot of cartoon Chinese characters thats what i think they are but it was different. The crown of the jewels was in the basement, a lot of jewellery and artefacts spanning hundreds and hundreds of years items it was a nice collection, the only drawback was no photos, pictures were allowed down there, I don’t know why but it would’ve been good to capture some marvellous collections, and historical items I was sad at that but overall it was a nice place to visit. Here below are some Permanent attractions listed that we have seen. Aura: Religious Art in Bangko Sentral ng Pilipinas Collection. The Colonial Subject as Master. Classical Philippine Pottery from the 8th to the 13th Century.